July 17, 2010 (San Diego’s East County) – Thirsty for ideas to use less water yet still have attractive landscaping? 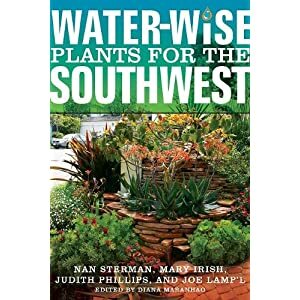 Water-Wise Plants for the Southwest (Cool Springs Press, 2010) offers a wealth of practical solutions ideal for homeowners in San Diego County, where drought, cutbacks in water supplies and rising water rates have become a way of life. Editor Diana Maranhao sought advice from four experts: Nan Sterman, Mary Irish, Judith Phillips, and Joe Lamp’l. All are garden writers; the first three have expertise in specific geographic areas (California, Arizona, New Mexico) while Lamp’l provides green gardening tips. March 18, 2010 (El Cajon) -- San Diegans are invited to attend this year’s spring gardening season kick-off event on Saturday, March 20, 2010. The Water Conservation Garden, in partnership with San Diego Gas & Electric will open the spring planting season by offering a large variety of elegant drought resistant plants and providing expert gardening advice. Attendees eligible to win a free Home Landscape Re-design--$700 value! (RANCHO SAN DIEGO, CA)—Fall is here--San Diego’s second planting season. The Water Conservation Garden celebrates with an exposition of drought tolerant landscaping on Saturday, November 14, 2009, 9am-3pm, at the Water Smart Gardening Festival. Admission and parking are free.